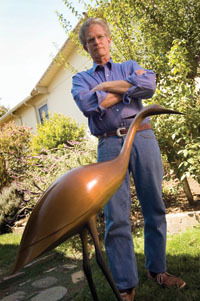 That celebrity sale was all it took to wet Allen’s whistle for bird sculpting. He continued carving through high school and even for a time in the Navy. Getting married spawned new dreams of success as his artist wife, Rosemary, stood by him in his endeavors. “When we came to Mendocino in 1966,” Allen recalls, “we didn’t have any money in the bank.” So the couple boxed up some of Allen’s birds and held a one day show in the Bay Area. It was a sellout, and the money they made was enough to live modestly for a year. When an order comes in, the work begins with the wood whittling and ends with a process that includes pouring 2,000-degree bronze into a ceramic shell. When the bird is removed, the bronze is enhanced with its own patina. 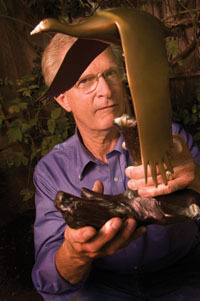 All Allen’s pieces are limited editions of 100, but the patina is done by hand, and that makes each creation unique. You can see Wheatley Allen’s work online at www.wheatleyallen.com. His new book, Howard Wheatley Allen—Sculptor to Emperors, President and Kings, is available on his Web site.